Anthropologie is my favorite store. I spend waaaaayyyy too much money there. Say what you will about it (Overpriced? Yes. Fashions can be weird? Yes. CEO is apparently not a great guy? Probably, if the rumors are true. ), I still lovelovelove it. There is an Anthropologie right across the street from a theatre I work at a lot, and I have found it impossible not to stop in and browse all of the lovely things whenever I’m on a break. And I usually buy something. Or a couple things, especially if there is a sale. Just walking into the store makes me feel a little happier. 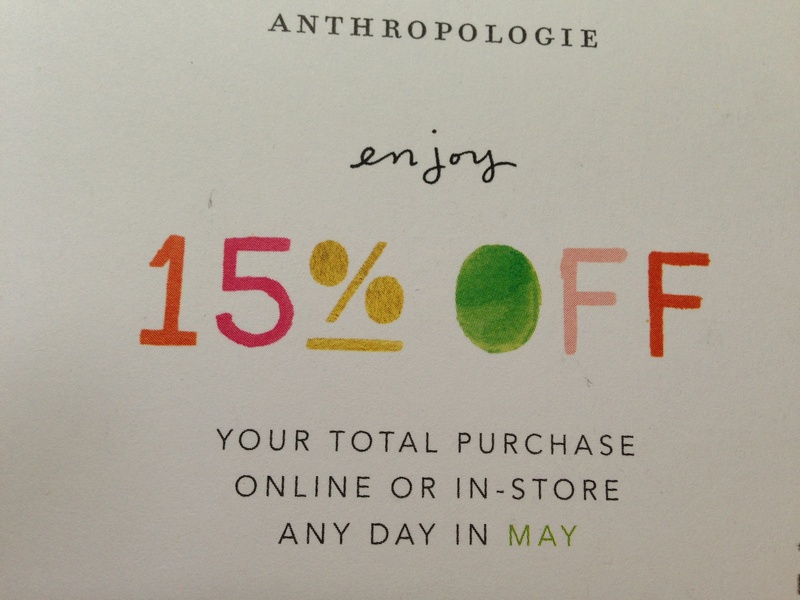 Because I am an “Anthro” member, and membership has its privileges, I get a coupon for 15% off any purchase in my birthday month, May. In the past, I usually have gotten a gift card from Anthropologie as one of my presents, so I have happily gone in to reap both the discount and the gift card at the same time. That has always been a very fun day for me. But as you know, this year, I only got one thing for my birthday, my new Mac. I have no regrets – I love it. But in my current financial straits, and with no gift card to help out, and the average cost of most items in the store being over $100, 15% is not going to do much for me. I would have to put anything I bought on my credit card, and I am adamant about not doing that right now unless it’s an emergency. I am also in the process of completely re-evaluating my wardrobe, and it seems a little dumb to run out and buy new things before I’ve gotten what I already own pared down and organized so I can see where the gaps are. So I’m not using my birthday month discount this year. Last night, just to be sure, I went online to see what was on display, and really, for the most part, there wasn’t anything that made me delirious with want – which was kinda surprising. Either I am getting more focused and less crazy on the whole wardrobe issue (let’s hope), or the stuff just wasn’t that great right now (maybe – it seemed to be a lot of sack-like things, or weird tops with peplums. I’m not big on peplums). 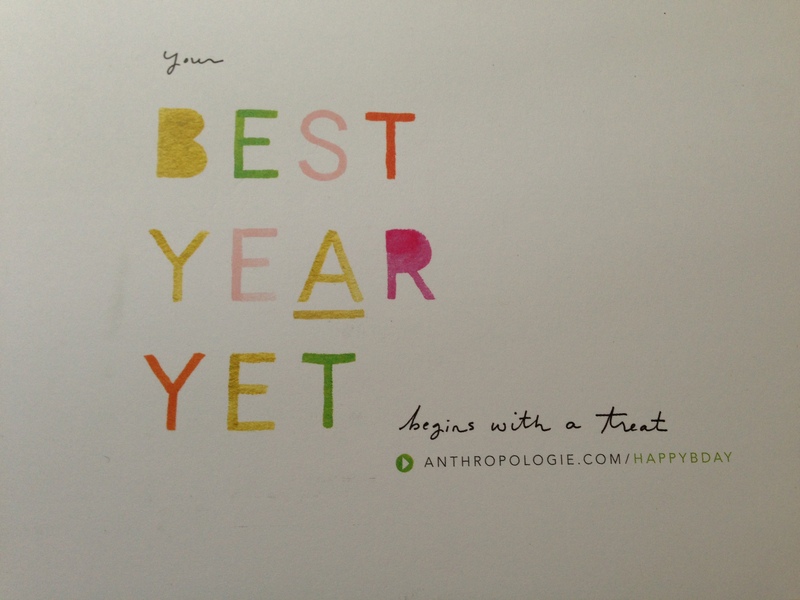 It makes me a little sad – my Anthropologie birthday splurge was always a ritual that brought me a lot of joy. But I’m open to that being replaced with some other happy thing – like being out of debt. Happy for you. Resistance, your name is Laura.